A week before Thanksgiving every year, millions of smokers commit to a longer, healthier future by kicking their tobacco addiction. The Great American Smokeout urges people to stay smoke-free for a day, perhaps forever. The costs of smoking are great, both physically and economically. Smokingkills 24,500 Texans each year and costs $12.2 billion in medical care expensesand lost productivity. That is more than the number of deaths from AIDS, heroin, cocaine, alcohol, car accidents, fire, and murder combined. The benefits of quitting are equally great. 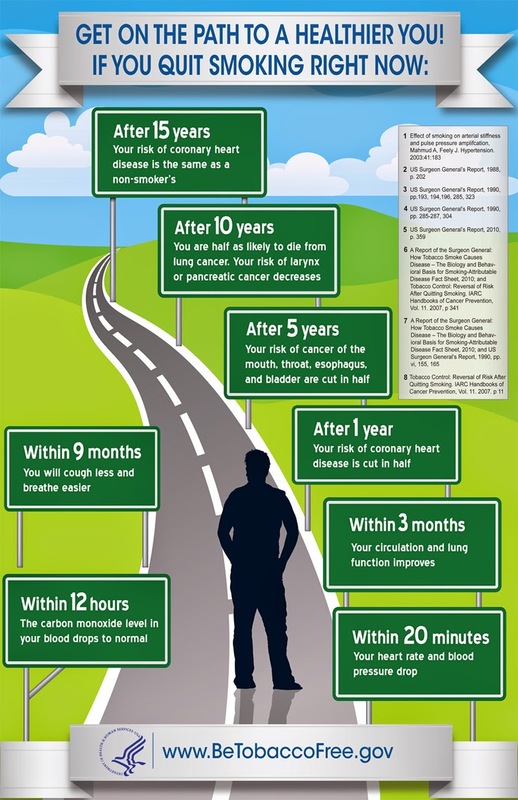 The infographic below shows the immediate and long-term benefits for people who make the decision to live tobacco-free. Quitters not only improve their own health, but the health of those around them too, since second-handsmoke causes lung cancer, heart disease, asthma, and other illnesses. The American Cancer Society (ACS) created a quiz to help smokers who want to quit determine their level of nicotine dependence and offer tips on how to beat cravings. You can also check out ACS’s Facebook page to determine what type of Smokeout Character Quitter you are. The habit is hard to break but not impossible. Forty-two million Americans smoke cigarettes. Make the commitment to be one less by Nov. 17. Talk to your doctor for help and resources to quit smoking.